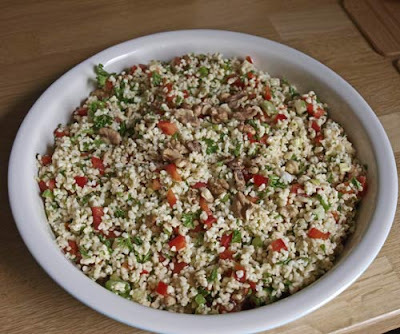 I regularly make a Bulgar Wheat Salad to take to work for my lunch and rarely use a recipe. 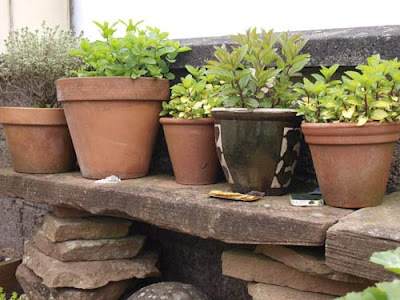 But I liked the sound of a recipe I found at 'What's Cooking America' I've made a few minor changes to the ingredients, this version didn't have mint in it and I love mint and have loads growing in pots at my patio. My parsley is a bit sparse (not shown) so I had to buy that. Put bulgar wheat in a deep bowl. Bring water to a boil, pour it over the bulgar and let it stand for an hour. Drain bulgar well and return it to the bowl. Add olive oil, olives, parsley, basil, red pepper, walnuts, spring onion, lemon juice, salt, and pepper; mix lightly. Cover and refrigerate 2 to 3 hours or overnight. 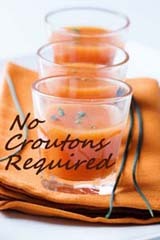 I'm entering this salad for the June 'No Crouton's Required' - Leafless Salads. No Croutons Required is a challenge run by Jacqueline at Tinned Tomatoes and Lisa at Lisa's Kitchen I'm hoping that parsley and mint count as herbs rather than 'leaves'!!! 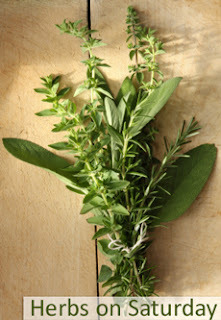 I'm also entering the salad for Karen's Herbs on Saturday challenge at Lavender and Lovage. I can really recommend this salad. It keeps well in a sealed container in the fridge for a couple of days, so you can make it ahead and make plenty, have it several times or, like me, take some to work for your lunch. 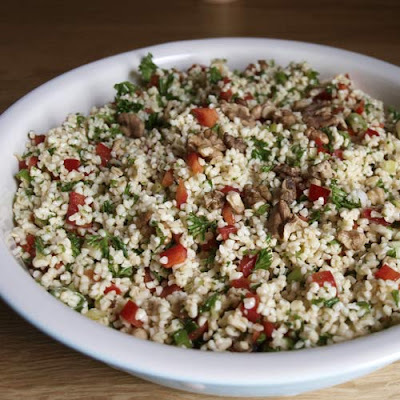 A REALLY useful and tasty recipe...and I am a big lover of tabbouleh as well as couscous....thanks for much for entering this into Herbs on Saturday. 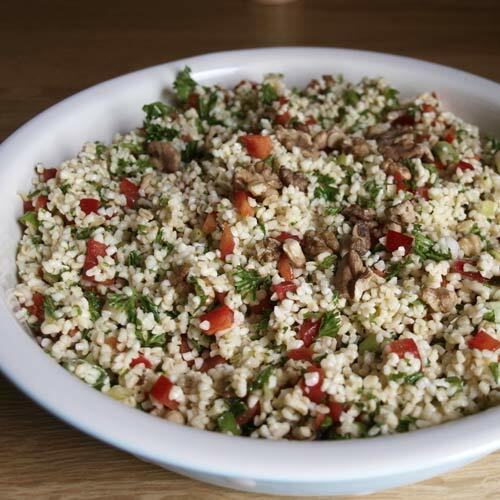 Mmmm, love Tabbouleh. I've been making it ever since a Syrian boyfriend at University showed me just how it should be done. Just waiting for the tomato season to come into force and I'll be making it again. It looks so tasty! Was just thinking this is just what I need to eat more of and want to try more grain salads. I must try your recipe!